Weather has been tough this week, but we did manage to get out. We started earlier in the week with return clients Dave Kashak, his son Chase, Jaime Scattoh and his son Max on a 5hr Striped Bass charter. It was a tough day, we had to grind quite a few areas. We worked the areas around the inlet, but it was a little sporty for the boys and then tried a few close snags for Blackfish. Unfortunately we couldn't get a bite due to dirty water. We headed in the backwaters and found some cooperative Stripers which we ended up keeping one tagged 24 inches. The crew ended with 10 Stripers all on live bait. Trust me - I’m chomping at the bit to get back to what I love to do - FISHING!! We have been waiting for the new 250HP repower, but due to some shipping issues with the manufacturer it’s taking longer than expected. I’m hearing that the new engine should be installed and back in the water before Halloween. I have been dying to try out the new MINN KOTA trolling motor as I will most likely start running Sea Bass and Blackfish trips - not sure if going to start this season as I have to get my feet wet with the new trolling motor. Most of my morning Striped Bass trips are booked, but I do have the following dates remaining. Early December is still open and we may stay in for Blackfish. The following time slots available for Striped Bass: 11/4 afternoon, 11/5 afternoon, 11/6 afternoon, 11/7 afternoon, 11/8 afternoon, 11/9 afternoon, 11/11 afternoon, 11/16 morning, 11/17 afternoon, 11/18 afternoon, Thanksgiving morning - 6-10am, 11/24 afternoon), 11/26 afternoon, 11/28 afternoon, 11/30 afternoon. We have been out of the water for over a week - repowering with a new 250HP engine. During the hiatus, my dad and I have started mounting the MINN KOTA ULTERRA trolling motor with our custom bracket. It will definitely open up new wreck dwelling species, among other ones. Can't wait to SPOT-LOCK!! A huge shout out to Tyson Alvanos of Minn Kota, Nino Aversa, Phil Natale, and South Harbor Fishing for helping out. Pics to follow!! It’s a little late, but recently I had return client Lou Sigilo with his college buddy John Murphy on a 4hr Bay & Inlet trip. We focused on Northern Puffers for the first few hours and the guys did an excellent job catching well over 140, keeping about 80 for the freezer. We attempted the inlet to go for some bluefish on metals and soft plastics, even though there were birds working, the swell and wave action was too unsafe. We worked some areas in the back with light tackle gear to catch a few different species (Bluefish, Sea Bass, etc). Last Day Fluke - Ocean Crushed it, Bay not so much! Late morning, I had return clients Doug Wainwright, his son Doug Jr., and family friend Tim on a 4hr Bay/Inlet trip. We started working for Fluke with live baits, but the water was very dirty. We moved around a few spots but could only find them to 16.5 inches, and a few small Bluefish. With about an hour left, we switched over to Blowfish and anchored in one of the areas. We had a good bite for the first 20 minutes, but it soon died out, even with heavy chumming. The guys ended catching 4 different species (Fluke, Bluefish, Blowfish, and Kingfish). It was slow to my standards, by the guys still had a blast. This was Tim’s first time ever fishing in NJ saltwater! We had some rough weather last week and the bay has still been dirty which makes targeting Fluke in the inlet a little challenging. We haven’t been inshore due to the sea conditions, but I have a few trips booked the last day. Barnegat Bay does have a decent amount of Blowfish right now, so they are definitely an option the rest of September. We will be running afternoon trips during the week 230 to 630 for a variety of species (Bay/Inlet/Ocean), and have the ability to use our Striped Bass tags. I’m hearing there are lots of False Albacore and some Bonita north around the Sandy Hook area, so we are primed to go for them in the next few weeks. Just received a large order from Hogy lures!! 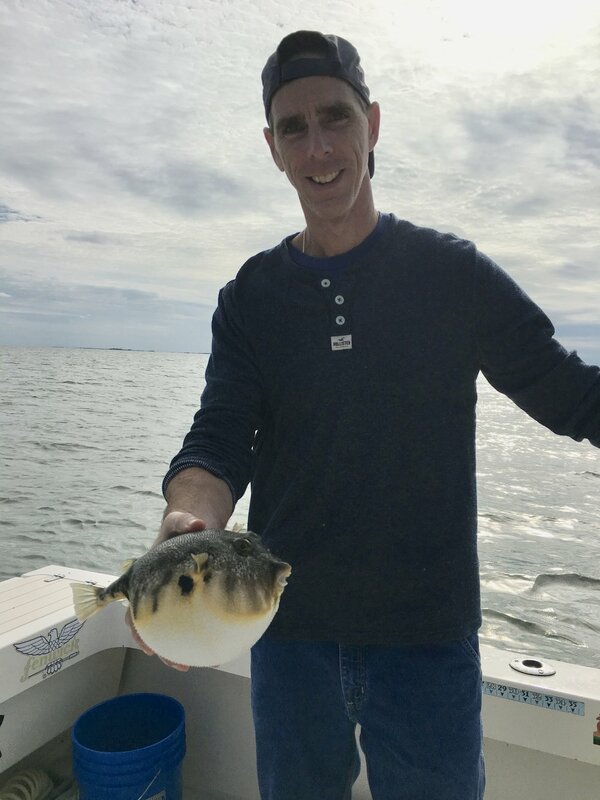 Yesterday I had return client Bruce Connor of Illinois on an afternoon 4hr Bay charter and with limited options due to weather conditions, Bruce opted for backbay Blowfish. We went to our 1st spot through pea-soup thick fog and anchored up. Bruce started bailing Blowfish on the 1st drop and we never left the area. He also caught a few small Sea Bass, Dogfish, Fluke, and Bluefish, and kept 85 Blowfish that would be a real treat in Illinois. Awesome foggy afternoon on the water! This weekend was a literal washout and we had 3 Ocean Fluke cancellations, but I'll be back running some trips this week unless we get a strong dose of FLORENCE. Unfortunately, if we get any tropical systems, it may be the early close of Fluke as they migrate hard Eastward. I did take the time to start getting my Fall Striped Bass gear ready, pouring sinkers, and re-rigging some of the rods/reels. I did pick up my allotted Striped Bass Bonus permits, so we will be able to box 1 Striped Bass per person (24 to 27.99 inches). Personally, these are the best eating quality as they are young fish and it's better to release some of the bigger females! I had return client Mike Sicilia of Barnegat with his son James and two friends Caleb and Shane on a 5hr Ocean Fluke trip. We worked some new areas targeting bigger Fluke in the Ocean with the S&S Rattling Bigeye tipped with Gulp baits. Th foursome did an awesome job releasing close to 40 Fluke while keeping 11 for the table. Mike caught his personal best with a solid 27-inch Fluke weighing over 7 pounds. Nice job!! Thursday afternoon - I had new clients David Block with his son Brandon on a 4hr Bay/Inlet Fluke trip. We had less than ideal tidal conditions and a tough time with the black flies, but the father & son team managed to release close to 30 Fluke. They worked live mullet to box 4 keepers to 6.5 pounds and Brandon scored his personal best with the 6.5 pounder taping out to 26 inches. We worked pretty skinny water with most keepers being caught in 3 to 6 feet around the inlet. Nice job!! Thursday morning - I had new clients Will Petzinger with his daughter Rachel, son Bill and Jen Sanchez on a 5hr Ocean Fluke trip. We hit a couple of snags within a few miles of the inlet and found some nice fish. The crew was able to box 5 keepers to 5 pounds, Sea Bass, and chub Mackerel. We did lose a beautiful one boat side that probably weighed 8/9 pounds based on the length of the doormat! Overall, great day. Wednesday - I had new client Noel Allaud with his two boys Matthew and William on a 4hr Bay/Inlet trip. The trip was a birthday gift for William who turned 15 and it was the boys first ever Fluke trip. We started working some areas that were very shallow close to the inlet and found some feeding fish. The boys did a great job releasing about 30 fish and boxing 4 keepers to 5 pounds. Awesome job!! Most of the fish were caught on live mullet. Tuesday - I had return client Art Diebel, his son Walter, and family friend Danny Unger on a 5hr Ocean Fluke trip. We started working some small snags and areas offshore. It was game on with the trio boxing 6 keeper Fluke to 7 pounds, Sea Bass, and a two Bluefish. All fish were caught on the S&S Bigeye bucktail tipped with Berkley Gulp! Approximately 65 fish were released. Today was "technically" a day off, but my wife Jennifer Taylor and son Luke wanted to get into some Ocean Fluke. We worked some areas that I have been working with my charters and we had our 9-fish limit by noon. Although I dropped two big fish, Luke and Jen picked up the slack. My 10yr old caught 5 keepers to 5 pounds and Jen caught 4 keepers to 7 pounds. We released 3 others at 18/19 inches! Great day on the water and I'm so proud of Luke - the kid outfished all of us today. Thank god my job is to put them on fish, not catch'em! LOL! All fish caught on the S&S Bigeye rattle (naked and with hair)!